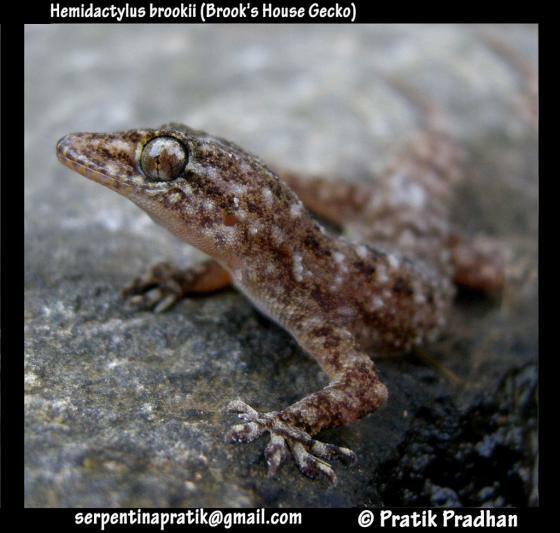 Can you confirm these amateur observations of Hemidactylus brookii? Americas: Mexico, Honduras (WILSON & MCCRANIE 2002). Types Lectotype: BMNH 1947.3.6.47 (formerly BM RR1934.9.1.49.21.a), designated by Mahony 2011. Diagnosis Diagnosis. Hemidactylus brookii can be distinguished from all currently described Asian members of Hemidactylus based on the following combination of characters: adult male SVL to 55.8 mm, TrL/SVL 38.5–38.9%; primary postmental shield width is subequal to that of the first infralabials, secondary pair broadly in contact with second infralabials; ear opening large EarL/HL 8.2–11.2%, obliquely oval; 16–19 regular longitudinal rows of dorsal tubercles, largest 6–7 times size of surrounding granules; two series of 12–13 precloacal-femoral pores separated medially from each other by a diastema of one non-pore-bearing scale, non-pore-bearing scale <50% the size of pored scales, scale row bordering anteriorly the precloacal-femoral pore series enlarged, ≥ size of pore-bearing scales; 5 lamellae under digit I and 7–8 under digit IV of pes, subdigital lamellae mostly divided on digit IV of manus and pes, enlarged lamellae series under digit IV of pes extend to the base of the digit; tail oval in cross-section without lateral denticulation, tubercles on anterior tail portion form elongated recurved conical spines, subcau- dals completely transverse the tail width from the distal third of original tail; two medium sized conical cloacal spurs [from Mahony 2011]. Comment Original description in Amarasinghe et al. 2009. Synonymy after KLUGE 1993. 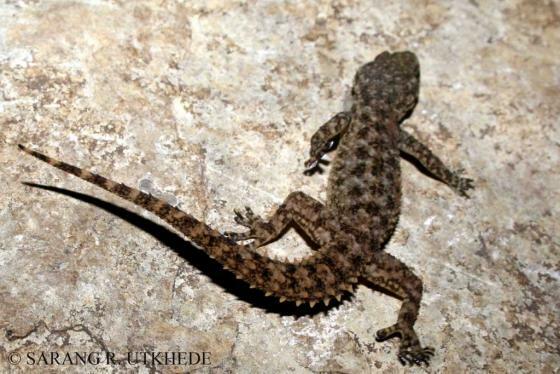 Hemidactylus brookii haitianus has been raised to species status by POWELL et al. 1996 and subsequently synonymized with H. angulatus. MAHONY (2009) mentions subtriedroides as a synonym of H. brooki but revalidated it in 2011. 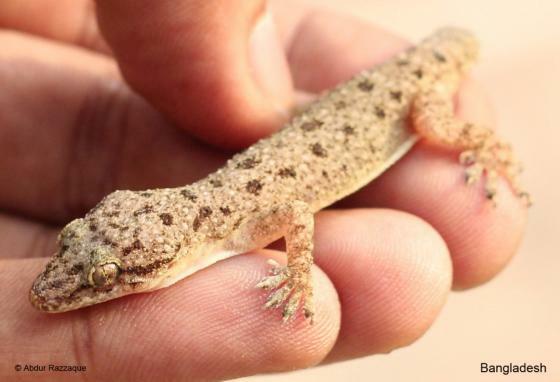 Hemidactylus tenkatei [LIDTH DE JEUDE 1895] has been removed from the synonymy of brooki. 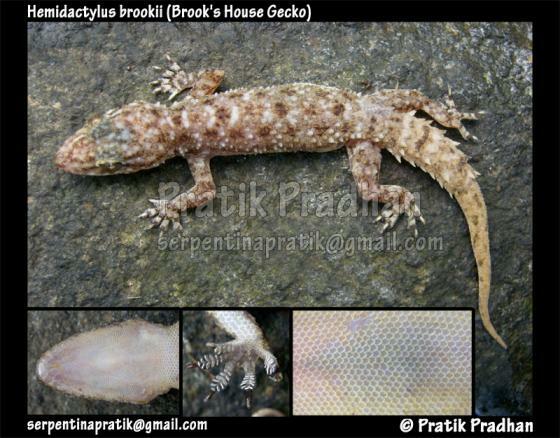 According to RÖSLER & GLAW 2010 H. brooki leightoni is probably a synonym of H. angulatus. 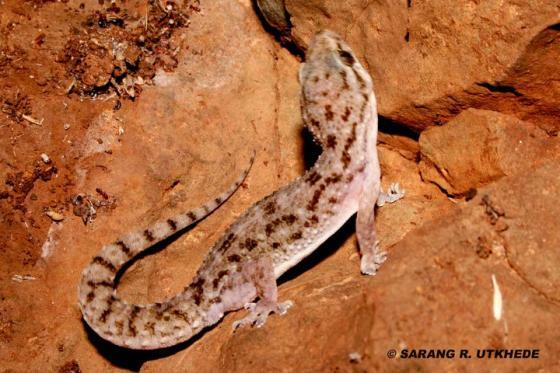 Hemidactylus brookii parvimaculatus DERANIYAGALA 1953 has been elevated to full species status. 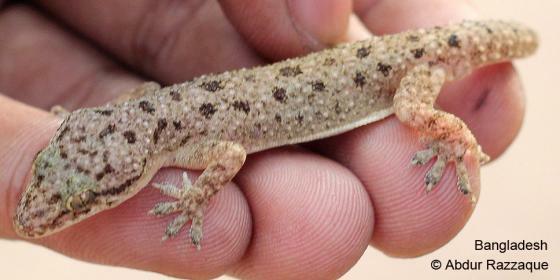 Hemidactylus brookii subtriedroides ANNANDALE 1905 has been synonymized with H. tenkatei by MAHONY 2011. 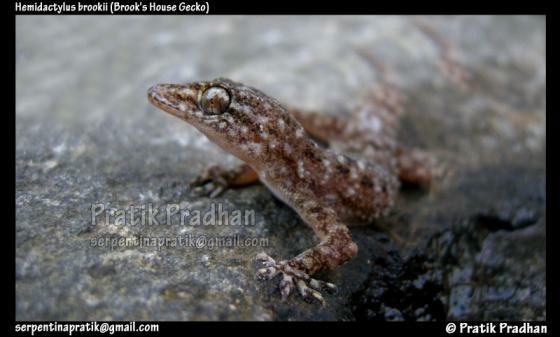 Hemidactylus gleadowi MURRAY 1884: 260, previously a synonym of H. brooki, has been revalidated by MAHONY 2011. Distribution: Not on Borneo fide MALKMUS et al. (2002). Not on Madagascar fide F. GLAW; reports from the Comoros and nearby islands (Rodrigues, Mauritius, Reunion) represent H. parvimaculatus (pers. comm. 21 Feb 2010, 28 Dec 2012). Erroneously recorded from Australia (but may have been introduced there). Loveridge 1947 and Wermuth 1965 erroneously suggested that Adafoa, Ghana = Adafer, Mauritania. 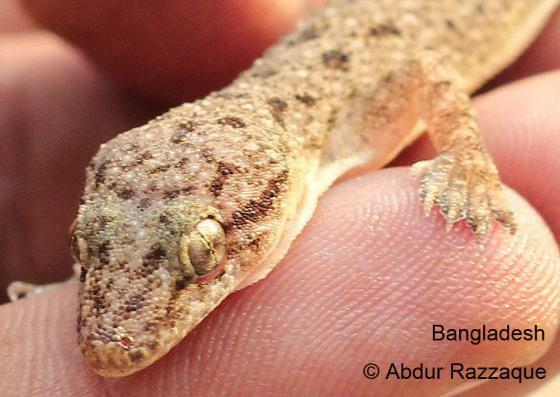 African populations of the polyspecific Hemidactylus brooki complex are now considered as a valid species, H. angulatus (African countries may need to be deleted from this list). Listed for Honduras by Wilson & McCranie 2002 but not by Solis et al. 2014. McCranie 2015: 365 followed Bauer et al. 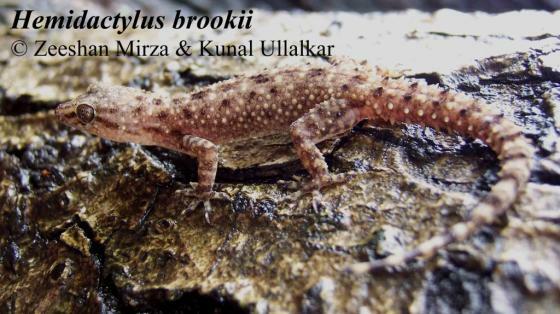 2010 stating that “New World populations of the H. brookii-H. angulatus complex should be H. haitianus pending further study”. Not in East Africa (i.e. Kenya, Tanzania, Uganda, Rwanda, Burundi fide S. Spawls, pers. comm., 28 June 2018). Distribution: Not in Angola fide Marques et al. 2018. Appearance: Highly variable in color pattern. Similar species: Maybe confused with the broadly sympatric H. mabouia. Etymology The specific epithet was originally created as a patronym in honour of Sir James Brooke (1803–1868), an acknowledged contributor of specimens to BMNH (Gray 1845). Known as the “Rajah of Sarawak”, for- merly Governor of Sarawak from 1841, and Governor of Labuan and Consul-General to the Sultan of Brunei from 1846 (Schleich & Kästle 2002). Deraniyagala, P.E.P. 1953. A coloured atlas of some vertebrates from Ceylon. Vol. 2. 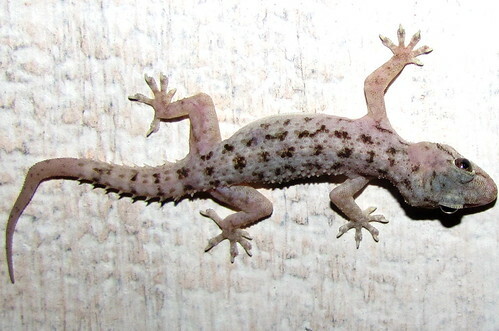 Tetrapod Reptilia. Govt. Press, Colombo, 101 pp. Gonzalez-Negron, Alberto Jose 2004. 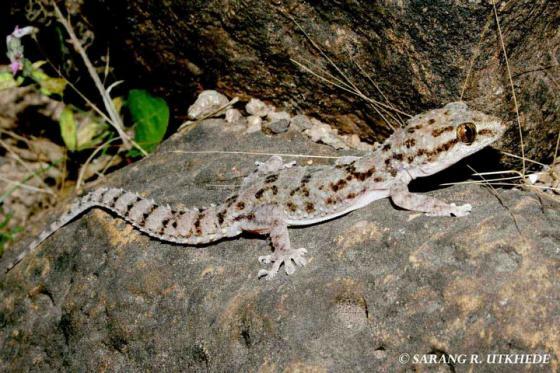 Morphometric and Molecular Analysis of the Mabouia-brooki haitianus Complex (Sauria: Gekkonidae) at the Western-Central Region of Puerto Rico. M.S. thesis, University of Puerto Rico, Mayaguez.